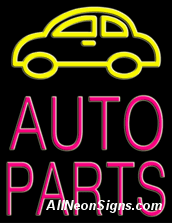 Auto Parts Neon Sign - We use this image and layout in several different neon signs for one simple reason: it works! This neon Auto Parts sign with the bright yellow neon car attracts attention. With a simple message, it quickly lets customers know what business your in and what products they�ll find within your doors. With its substantial size and pronounced pink lettering, drivers in need of everything from wiper fluid to side mirrors, and floor mats to brake light bulbs, will be stopping to shop with you. Especially today, customers want to keep their cars in good working condition. Help show them the way with this prominent neon beauty.